I guess this photo gives new meaning to the term “cookout”. 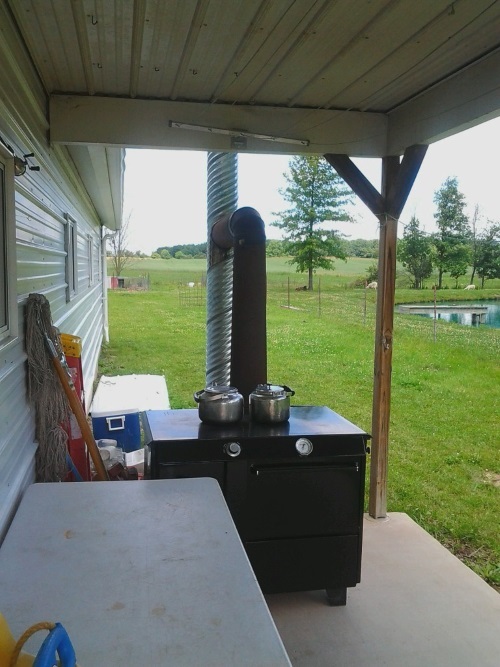 This is an Ashland wood-burning kitchen stove, which was moved outside for summer cooking. Taken by contributor ShipshewanaIndiana in the Adams County settlement. Since A/C is not a thing in Amish homes, you have to make other arrangements in the summer time. This is why some Amish families spend more time in their cool basements during the sticky months. The Amish of northern Indiana (Elkhart/Lagrange counties, Nappanee), a large chunk of whom work for non-Amish employers in the RV industry and whose orbits align perhaps a bit more with those of English America than other Amish, typically enjoy time off on Independence Day. I recall meeting families in this settlement on the way to the local fireworks display while living in the area two summers ago. Amish moms and kids were as excited to see the show as, say, any family plucked from American suburbia might be. What about that most ubiquitous of American symbols, the flag? No doubt they will be seen proudly waving on the front lawns of many homes today. Though Amish appreciate being able to live in a democratic nation, the liberties and privileges they are allowed, and the protection they receive from the state, they rarely if ever engage in explicit displays of patriotism. Out of the few thousand Amish homes I’ve visited in half-a-dozen states to date, I have yet to come upon one with the Stars-and-Stripes hoisted out front. And I don’t expect to. But there are the buggy races which should be happening today in Topeka, Indiana. If you happen to be in the northern Indiana area over the 4th weekend, the Arment Gallery (125 N. Morton St, Shipshewana, IN) is offering 20% off anything in the store to Amish America readers. Just print this page and bring it in for your discount (offer valid through July 2014). We’ll be featuring more Arment Gallery photos next week and hearing from David Arment about his craft. 23 responses to Cooking out for the Fourth? I would love to be at a cook-out with the Amish, Me being a guy who loves cook-outs any time, can only imagine what tasty food would be served. I was invited one year for my birthday, to eat dinner at my friends who happen to be Amish, and I can honestly say the food was exceptionally good, so with that being said, I wonder what more delicious food would be there? Maybe if I’m lucky,I will be invited to one, oh I dream of that day. Have a great 4th everyone…be safe! I am going to be lucky enough to be at a cookout with some Amish friends next week when I go to Ohio. Very nice folks. Met them a few years back and have become friends with them and visit them each time I make the trip up there. Love that area! Home, home on the range ! ….and a happy 4th to everyone! Margaret, Carolyn, your “captions” are spot-on! I’m smilin’ as I type this! Garrett, maybe we can tag along 🙂 with Kathy to her friends’ house in Ohio for some tasty Amish cuisine! How fortunate for you both to have Amish friends to dine with now and then! I love the idea of “summer kitchens”. I loved visiting summer kitchens in Williamsburg and other “historic” American settlements in different states. Even growing up in Chicago, we never had central air–only one window AC, and when that gave out, we spent most of our time in our knotty-pine remodeled basement where it was always several degrees cooler. I wish more “modern” homes had ample porches, like the one here, for enjoying more time “outdoors”, yet in the shade. Or for cooking purposes (I wonder who thought to move the stove out there? The cook, or her husband? Of course, I’m just assuming the cook is the lady of this Amish household). Thanks so much for the photo, Shipshewanaindiana! And thanks, Erik, for the whole posting on this, our 238th birthday as a nation. A safe and Happy Independence Day to all! We are hoping to visit an Amish settlement next week in Pawnee City, Nebraska and have heard there may be a few smaller Amish settlements in the areas of Orchard, Ewing, and Verdigre, Nebraska, but cannot find any information on whether these still exist. Does anyone know if there are any Amish still in this Northern part of the state of Nebraska? Thank you for the quick reply, Erik! Some of the information/links you provided I had seen, but some was new and helpful. I apologize if I repeat things you already know. I am in Nebraska and have been to most of the places you seek. Pawnee City is roughly 240 miles from the Orchard/Verdigre area. Unless your heart is set on going to those specific places I would head for just the one closest to you. “If” that would be the Northern Amish in Orchard/Verdigre I understand there is a new 3 family settlement in Center Nebraska… but have not been there. I would also consider hitting the only Amish settlement in Sound Dakota, in Tripp which is about an hour drive above the Orchard area. If I can be of any help let me know. People used to go out to the bathroom, and in to eat. Now they go out to eat, and in to the bathroom! Meadow Creek Barbecue of New Holland, PA, makes BBQ grills. Their large grills are used at fundraisers and benefit auctions. I understand there is a colony of Amish in Southern Colorado. Do they have little shops there and places to visit? I want very much to meet them. I’m fascinated by languages and while they call their language “Dutch” it sounds more like “Deutsch”. Andrea there are actually 4 communities in southern Colorado. None of them are very large but there are some businesses. 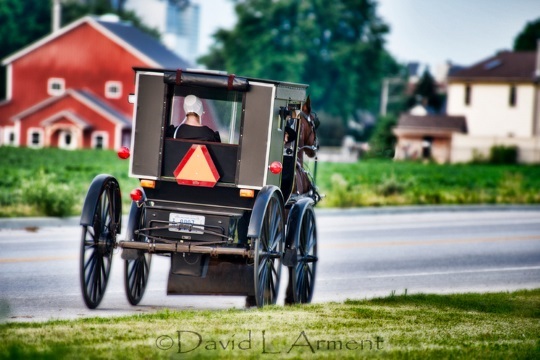 You can actually see one of the communities being scouted in the PBS film “The Amish”. There is footage of Amish visiting and checking out some land for a potential community. I think of old methods in Sweden to cope with the heat in summer. In some houses they would have a cooking stove on the second floor as well and cook on that in summer to keep the kitchen which was the main room for more or less everything as cool as possible. Some would clean out the barn and live in the barn for summer while the animals lived in simple summer shelters outside. If they had two buildings on the property (for example one house for the family and one for the grand parents) they would all move in to one house and use the other for cooking. In northern Sweden “baking-cottages” are common, they are a small house with a big oven used mainly for baking. If these houses also had a cooking stove they were often also used for food in summer. The reason for not having the oven in the house was fire, a baking oven should be heated for quite a long time and with a lot of wood and it was considered a bigger fire hazard than just having fire for heating and cooking. Also, you solved the problem of the house being too hot from the heat of the oven as well. Elin, it is interesting that you posted this. That tradition existed in Texas up until about 100 years ago or so. The earliest houses were generally a one of two room cabin, but typically with no kitchen. It was in a self-contained building away from the house to keep the house cool and lessen the chance of a total loss because of fire. When the family’s fortunes increased they would add a mirror image cabin joined by a porch that ran right down the middle of the two halves, often with a new roof that covered everything. The house was then called a “dog trot” house for the breezeway down the middle. The kitchen, however, remained where it was. I will tell you that this is actually a very old idea. It was very common in the 19th century to have one cookstove on a farm which was moved back and forth between the main house and the summer kitchen. The summer kitchen really being intended to keep the main house cooler in the summer, plus the bigger meals at harvest could be prepared without tracking a lot of extra dirt into the main house. My folks often talked about the “hoch koche” or ‘big cooking’ such as canning or butchering that also took place in the summer kitchens. I think the summer kitchen concept is a good, even necessary idea in days before mechanical cooling. But aren’t summer kitchens usually separate structures? Or would we call something like this a summer kitchen, even though it appears improvised on the porch? The English people called us Dutch. We call ourselves and our language Deitsch which is dialect for Deutsch. I can tell that in my region of Pennsylvania, the summer kitchen was a separate building especially on farmsteads that were built in the eighteenth century. Sometimes they were also the original settler’s cottage that was transformed into a summer kitchen when the main house was completed. The newer farmsteads still had a detached summer kitchen that was often joined to the back of the house by a breezeway or porch. My farmhouse is actually late nineteenth century and at that point the summer kitchen was attached to the house but closed off by a doorway. The concept was still the same. Many times the summer kitchens have been converted to a wash house/laundry house. I also know of some that were converted to canning kitchens, again a vaariation on a theme. In the southern states the kitchens were also detached, however, I’ve been told that was more to protect the main house in the event of a kitchen fire. Interesting Terry. I believe one of my friends in Lancaster actually had his old summer kitchen converted to a small living quarters. It’s not there any longer however, had to go when they expanded the home. Leave a reply to Cooking out for the Fourth?